A bug is absolutely excessive for bear defense. All you need to do is punch them! Michael, you have a lot going on. Don't let silly things like some of the responses here get to you! Michael, I think you would agree with me on this: The Spyderco Delica and Endura are nearly perfect user knives and can outperform all others for most cutting tasks. True? All except the Para 3 which consistently is considered by all experts as the world's only perfect knife. Well, except for that lanyard hole. I think Sal was spot on when he said that “need” is not a useful term in the context of this discussion. This is about preference in our pocket carry. Which knives do we find best suited to our uses and our environment. When doing construction or spending time in nature I prefer 3.5” to 4.0” blades. In more formal settings like church or concerts I prefer thinner bodied folding knives in the 2.5”-3.5” range. Today I’m carrying a Military plus an old SAK Spartan in back pocket that needs the small blade sharpened because I used it in a cafe yesterday to de-burr a pair of stamped aluminum signs. I'd rather have more than necessary given it has a choil. Hey, Michael. I took your question in the spirit you asked it, and got stumped. When Sal mentioned preference, I saw that, like him, I didn’t need a large knife, but I preferred one to smaller Spydies (of which I have a bunch). All to say, with the arrival of my superb Kapara, I’ll declare we now have a big-little knife, indeed, something smaller (and lighter, I sense) than the PM2 you have. Whether you can convince folks here that they can get by without larger knives, I’ll bet you can’t get by without the Kapara. What a sneaky design. RECENT ARRIVALS: WaterWay; VG10 Stretch2. ON RADAR: AEB-L Urban; Maxamet PM2; Native Chief; Nishijin “R”. IN DREAMS: 10V Military; Cruwear/K390 Shaman; 3V/4V Native Chief; Slysz Swayback; Anso Rock Lobster; C27 serrated Jess Horn. Thanks for your cogent reply. Yep, preferences are what bring joy and fun to being a knife afi. No doubt. And, that Kapara is certainly on my “need” list. It seems like an excellent all around knife regardless of size. I would never presume to tell someone which knife they need or want. That’s a personal decision. But, I figure if someone is in a position to really need a knife in most, repeat, most instances a small one will get the job done. I suppose, for me, I could be quite happy with my Lil’ Lum and a Kapara when little isn’t enough. Lol. Thank you for this! I am gladly surprised to see Sal prefers larger knives! 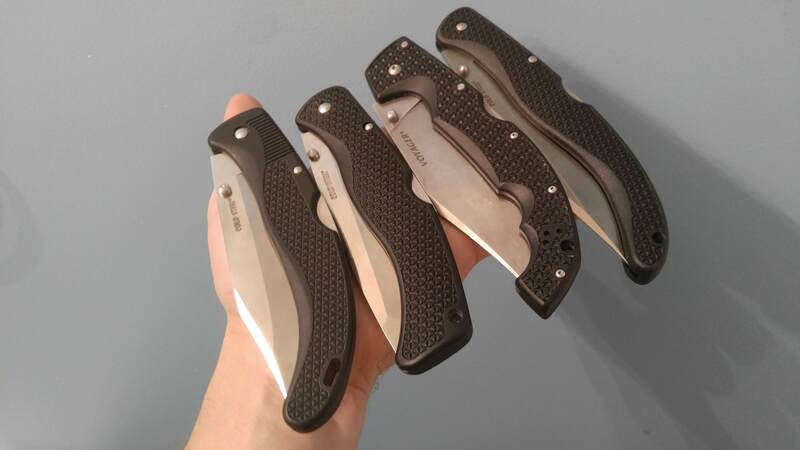 Judging by spyderco's lineup and the preferences of the knife community, all I can tell is that he's done a pretty good job supplying what the market demands. The preferences of other knife owners are more obvious I'd say. I doubt Medford or Thompson, given the task of choosing one spyderco to edc for life, would choose a Para 3, lol. I'm glad spyderco offers the Military, P4, Manix XL, etc. I wish more companies made at least ONE model in the 4.5 to 4.75 inch range. I own a 4" CS Recon 1 and gave a Voyager XL to my brother 2 years ago so I got to hold it. 5.5 inches is certainly overkill for me but I could make it work. But boy, those things will start some conversations! I feel like something in-between the 4" and 5.5" models would be right up my alley, but I hardly know of any folders that size that exist. I'm glad spyderco offers the Military, P4, Manix XL, etc. I wish more companies made at least ONE model in the 4.5 to 4.75 inch range. I own a 4" CS Recon 1 and gave a Voyager XL to my brother 2 years ago so I got to hold it. 5.5 inches is certainly overkill for me but I could make it work. But boy, those things will start some conversations! I feel like something in-between the 4" and 5.5" models would be right up my alley, but I hardly know of any folders that size that exist. Yeah I would go on to say that myself. But truly and sincerely I found that I do indeed have a lot of real genuine NEED for a larger blade in many of my daily cutting chores. Ever since I made my hallowed M390 Military model my main EDC I now say to myself on a regular basis>> "How Did I Ever Get By Without This Great Tool To Begin With". I've even made my companion Spyderedged folder a larger blade and I'm using it a lot and I've found viable uses for it. It's kind of funny when I volunteer at my church I have a lot of the fellow members say "WHY DO YOU HAVE TO CARRY THOSE KNIVES"?? But those same people are always borrowing mine >> and I mean frequently too Yeah David hit that nail directly on dead center. As some others have said, for me handle size -- or more generally, handle ergonomics -- is more important than blade size qua blade size. I don't have enormous palm-a-basketball size hands, but they're large enough that smaller knives often have an awkward feel, and most companies don't seem to make knives with big handles and tiny blades. Now, you could argue that just because a knife isn't comfortable doesn't mean it's not usable, and therefore I don't actually need a larger knife. You'd be right, but in the same sense in which I don't "need" a knife that doesn't have a thumbtack sticking out of the handle either. (Looking at you, Southard lockbar cutouts!) An uncomfortable knife is a less efficient knife and, often, a less safe knife. Having said that, there are still small knives that feel better in my hand than others. For being so tiny, I'm regularly surprised by how big (in a good sense) the Meerkat feels in my hand. Is it as comfortable as a PM2 or an AFCK? No, it isn't, but it's good enough that it can reliably handle most of the tasks someone who works in an office might need. Come to that, I'm pretty sure most of the tasks I use a knife for can be taken care of by an old-fashioned keychain Coca-Cola bottle opener, but I live a life that's pretty undemanding toward knives. Last edited by cwp on Tue Nov 13, 2018 10:57 am, edited 1 time in total. 4.5-5" is the sweet spot for me too. After trying these different cold steel models (Thanks brother! ), I can confidently say I'd love a 5" blade Spyderco. My issue is most companies that do offer knives with blades over 4", tend to make them pretty overbuilt. That's why these CS designs are so awesome. That 6" blade Voyager X2 weighs less than a lot of 4" blade knives I've owned. That's why I'm interested in a Catcherman sprint run. It's a 4.5" blade but it weighs under 3oz, those are dream stats to me. Vivi my good Brother there is going to come a day>> and I don't think that day is too awful far away>> But there is going to be a day come when Spyderco is finally going to realize that the Catcherman needs to be back in the main line up. It is by far the very best folding fillet knife out there. And it's not constricted to just being a fillet knife either. I use 3 of my Catcherman models constantly for all kinds of cutting jobs but mostly in the food arena. But you are so right that the length and the weight of the Catcherman makes it an excellent all purpose knife for a myriad of cutting jobs. Why they didn't make anymore full Spyderedged versions is also beyond me. Just ask "xceptnl" if you all don't believe me. But I love the Catcherman in both edge types>> but especially in Spyderedge . If I need a bigger pocket knife than the Para 3, it's the Luzon Flipper. Well, the word "need" just touches some sort of hot button in me, and maybe other people too. My brain runs off in several directions, none of which even remotely resemble giving serious consideration to the question. Man knows how to use it. And the man with 100 Spydercos doesn't. 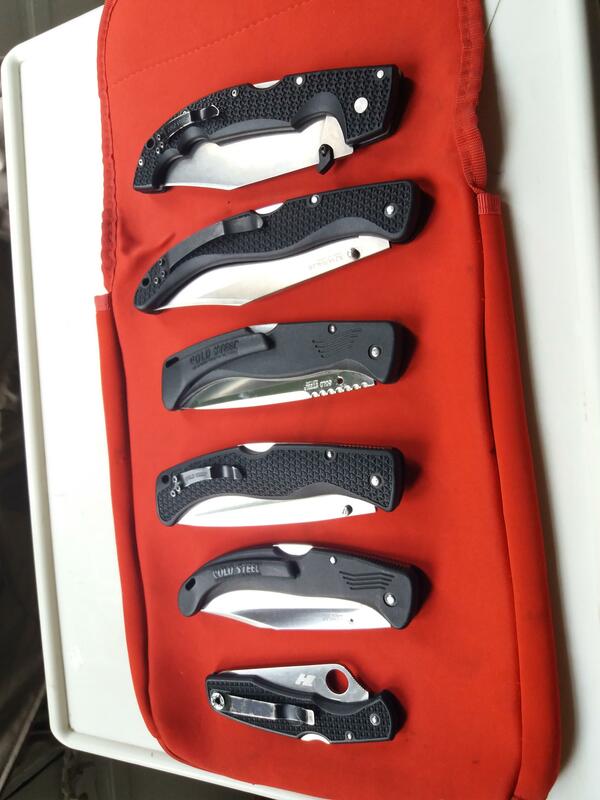 I carry a minimum of five knives and while I carry on in my day I have at least three out doing something with. It's such a habit that after 3 beers I have to wear cut proof gloves. Some are thrown, some are subjected to brutal torture and some are treated like newborn babies. 10 years ago I coined the phrase that I have more sharp blades than I could find things to cut. Maybe I can do a TV show where I use my knives to totally dismantle a warehouse or large building. The downside would obviously havick to my beloved knives. For that I would forever weep.